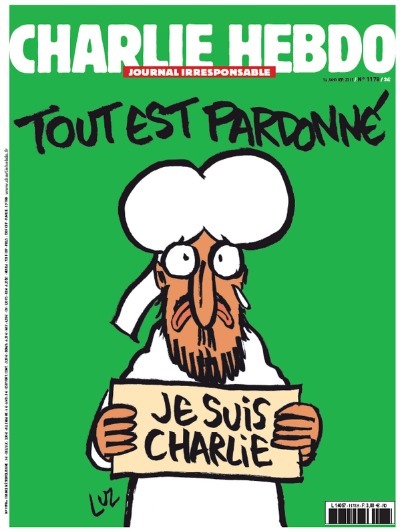 This will be the cover of the first edition of Charlie Hebdo issued since the massacre at its offices in France. There has been some debate over what it means. But it seems pretty clear to me that it is a picture of Mohammed and he is telling the people who caricatured him that all is forgiven. The tears show remorse for what his followers did, and while he may have been angry for how he was mocked, that it was a lesser crime than that committed by his followers. Pretty tame and PC message, but one that attempts to divide the enemy. It probably gives Mohammed more credit than he deserves based on his teachings and actions, but better to co-opt the enemy’s symbols and redefine them than be historically or scripturally accurate. Update: It looks like my interpretation was correct.